A suppression list contains addresses that cannot be sent to: Unsubscribed email addresses and/or a Do-Not-Email List that Brands want to exclude (existing clients). Whether you are an Advertising Network, a Media Agency or a Brand, we can provide you with an automated suppression list management software, allowing you to securely manage opt-outs from multiple lists and campaigns, and share information with your business partners thanks to our web services. In just minutes you can configure custom lists to control the flow of incoming unsubscribes. Compliance is just part of your business and we made things easy with our an easy-to-use interface. You can upload data, collect opt-out requests, and distribute your suppression lists with a few clicks. 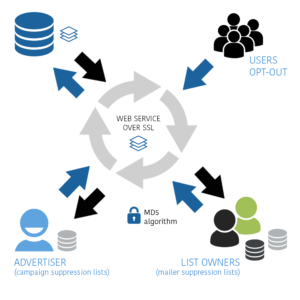 Data will be synchronized automatically and linked the proper suppression lists or campaign suppression lists. With an authenticated “access keys” both List owners and Advertisers will be able to obtain unsubscribed emails in a matter of seconds. You can upload and share campaign suppression lists. You may prevent marketing to current customers or avoid spamming a user who just unsubscribed, by allowing all the parties involved in the campaign to know in real time that an address opt-outed from the campaign. Documentation is important when you have to face users complaints. It can help you prove to agencies that you have done everything within your power to be compliant, and avoid expensive penalty. Moreover you can see how your affiliate partners are interacting with your campaign and suppression lists. List owners – if the service is active in your account – may login and scrub a list before a shot, against any of your your active campaign suppression lists and/or your global suppression list. They can obtain a “white list” or a “black list”, and they can either upload a text/plain database or a md5 database as the system will match against their database regardless the format you have stored. Lists are not stored, they are simply used for the scrubbing process and returned to the owner.